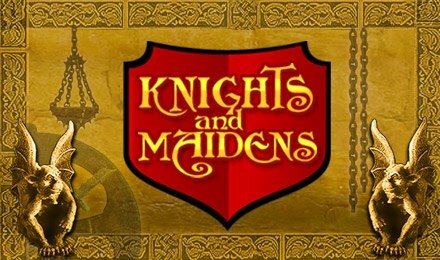 Discover a mythical era of chivalry on Knights and Maidens Slot at Wicked Jackpots. It is created and beautifully designed by Section 8. This slot consists of 5 reels and 25 paylines. Enter a fantastic world filled with majestic castles, shiny armours, heroic knights and beautiful maidens. Enjoy this game on any desktop or mobile device. The action on Knights and Maidens Slot takes place in a mysterious gothic castle. The reels are enclosed within an ornate frame. On them, you can find symbols like: Owl, Hunchback, Fairy, Dragon, Castle, 10, J, Q, K and A. Let yourself be captivated by the high-end graphics and sounds! Begin your gameplay on Knights and Maidens Slot, using the Left and Right arrows to adjust your bet. Next, choose your preferred number of paylines on the Line field with the Left and Right arrows. Hit the Spin button or use the Auto Play feature to enjoy several rounds played automatically. Your aim is to form combinations of the same symbols to trigger a win. Amount of Paylines Selection: Choose from 1 to 25 paylines. Coin Values: The coin values range from £0.05 to £10.00. On Knights and Maidens Slot, the Wizard represents Wild. It replaces all symbols in a winning combination, except Scatter. The Knight is the Scatter symbol. When 3, 4 and 5 Knights appear on the reels, 10, 20 and 30 Free Spins are awarded. If more Knights appear during the Free Spins Feature, the free spins are retriggered. Cavalier’s Quest is a mini game triggered with 3 or more Blonde-Haired Maiden bonus symbols. Try to rescue the maiden by climbing up the different levels and pick the correct items on your way. The more you progress, the more valuable the items are. However, the mini game is over when you pick “Game Over”.